Rather odd, if you inspected the seals and say they look good. The inner requires the Hyatt sleeve to be removed, and getting that inner seal out usually wrecks it. Photo shows a wrecked one coming out, didn't place this one. Think who did the install had the housing off, and then replaced that half of the housing with the axle sticking up and mis-aligned the seal in that process. Correctly placed, the new modern inner goes over the axle prior to install of the Hyatt sleeve. One way would be too thin a rear axle lube, or overfilled axle housing that can pump out the lube. The axle pumpkin is filled only 1/3 full max. Had a modern outer that leaked, but was caused by axle wobble that destroyed the o-ring with its spring inside. That whole rear end got a rebuild and doesn't leak now. 1/3 full is that 1/3 from bottom to plug? 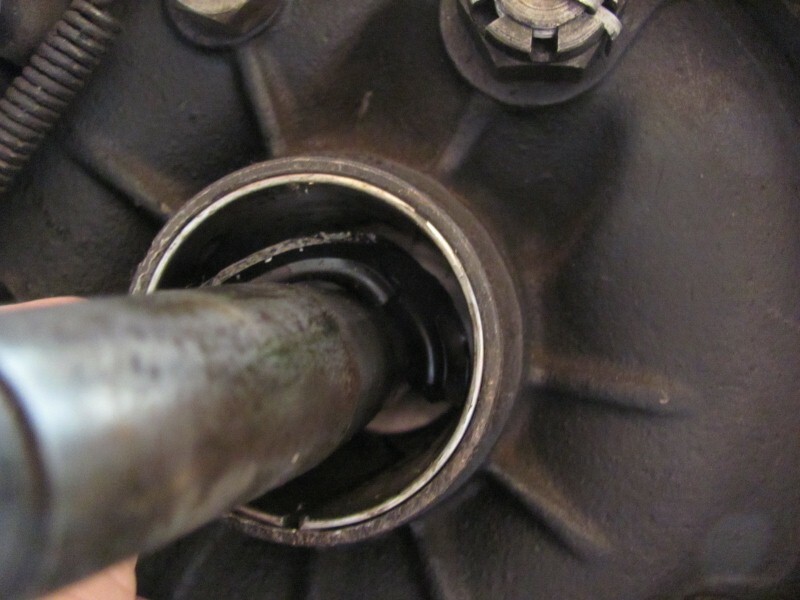 Depends on what year the rear axle is under your T. Around 1919, the fill hole was lowered to well below centerline - earlier housings had the fill hole AT centerline and it was suggested to hold the lubricant level to at least an inch below the fill hole on the early housings.